There are currently 126 people online. Toshiba is planning to release the Portégé M780 convertible tablet in the second quarter of this year. 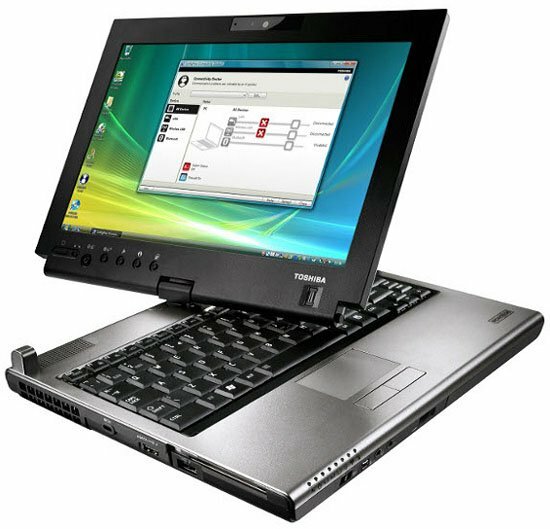 This new Windows 7 system features a 12.1" LED-backlit touchscreen with a 1200 x 800 pixel resolution, a Intel Core i3/i5 processor, up to 8GB DDR3 memory, 2.5" HDD or SSD, integrated graphics, a DVD burner, webcam, 802.11b/g/n WiFi, optional fingerprint sensor, Bluetooth 2.1, and the Computrace data/hardware safety and recovery service. The tablet features a rugged enclosure and a spill-resistant keyboard, it weighs as low as 2kg and measures 305mm x 239mm x 39.4mm.